Welcome to our first agriculture update for UK farmers, a new monthly edition on the Hawsons website. Please do register for our agriculture newsletter if you would like to receive the agriculture update each month, along with our quarterly agriculture newsletter and topical sector developments. Grants of between £5k and £150k are on offer to help groups of farmers, researchers and businesses research practical ways to boost productivity. Grants are available for projects up to 3 years in livestock, horticulture or forestry sectors. DEEC (Department of Energy and Climate Change) has removed the option for Feed in Tariffs (Fits) claimants to lock into a level of support before a project is completed. Fits pre-accreditation is being scrapped from 1 October 2015. Previously, pre-accreditation rules allowed solar and wind projects above 50kw and all hydro and anaerobic digestion projects to lock into a level of support once planning permission and a grid connection had been agreed. Farm leaders call for flexibility in 5 year averaging rules from HMRC, following the announcement of new farmers’ averaging rules earlier this year. When the announcement was made we said that prior to the new rules coming into effect from April 2016 the Government will hold a consultation later in 2015 to clarify details. That consultation on farmers’ averaging has started and the government consultation has proposed 2 options. Extending the existing 2 year farmers’ averaging scheme to a rolling 5 year basis with a volatility test to assess eligibility. An optional scheme where farmers could irrevocably opt-in for a fixed 5 year period, irrespective of volatility. The NFU have said that there may be a case for the 2 year averaging period being retained as an additional option. The CLA points out that the volatility within the agricultural sector could be experienced over shorter periods than 5 years so there should be an option to choose averaging over a shorter period. Grain price movements are likely to be limited in the medium term due to harvest results and export competition say traders. Online grade training platform Graindex launched. Recent drier conditions provided some relief for many arable farmers coping with a badly delayed harvest. Yields remain good but quality is still a concern. Micro-breweries are providing a rapidly growing market for some specialist malting barley. Potato prices dropped sharply in the week to 4 September 2015 with the average price falling £13.87T to £152.40T ex farm. 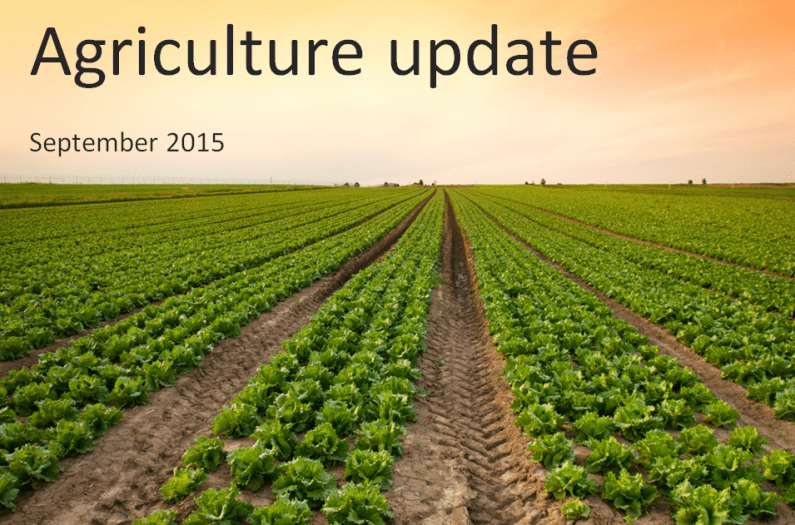 You can find all of our latest agriculture sector news and newsletters here. Richard Marsh is managing partner in the Doncaster office and joined Hawsons after working for two major international accounting firms. He has over 30 years’ experience in dealing with the needs of businesses of all sizes and acts for a wide range of commercial clients. For more details and advice, please contact Richard on [email protected] or 01302 367 262. You can also follow Richard on LinkedIn.